About the Book Today few appreciate what life was like on a Canadian homestead. Although the West was a harsh environment, settlers flocked there at the dawn of the last century. Among the scrub brush and hills of the northern prairie they strove to recreate themselves from nothing other than the land and hard work. Despite the difficult path, they experienced a richness of life in nature and family. These pioneers had resilience, the toughness of mind and spirit that built the heartland of Canada. A unique voice from that time can be heard in the tales of A Baker´s Dozen, fact-based historical accounts of a time gone by, when there were no cars, no televisions, and no telephones. 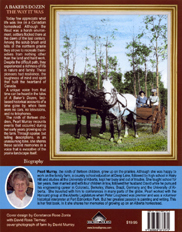 The ninth of thirteen children, Pearl Murray recounts events that occurred during her early years growing up on the farm. Through sparse but telling descriptions, in an unassuming tone, she shares these salient memories in a voice that is evocative of the prairie landscape itself. Pearl Murray, the ninth of thirteen children, grew up on the prairies. Although she was happy to work on the family farm, a country school education at Deep Lake, followed by high school in Hairy Hill and studies at the University of Alberta, kept her busy and out of trouble. She taught school for ten years, then married and with four children in tow, followed her husband David while he pursued his engineering career in Colorado, Berkeley, Wales, Brazil, Germany and the University of Alberta. She travelled with him to conferences in many parts of the globe. Pearl worked with the Hansard group at the Alberta Legislature when Peter Lougheed was premier and was a volunteer historical interpreter at Fort Edmonton Park. But her greatest passion is painting and writing. This is her first book. In it she shares her memories of growing up on an Alberta homestead.